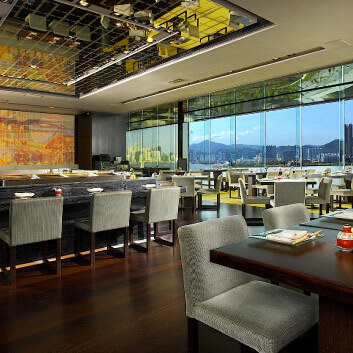 Experience stylish dining in Kowloon at The Royal Garden hotel. Choose between seven restaurants and a bar in our Tsim Sha Tsui hotel, including Dong Lai Shun was awarded ONE MICHELIN STAR restaurant by the Michelin Guide Hong Kong & Macau in 2013. Five of the restaurants in The Royal Garden hotel are being recognized by Commanderie des Cordons Bleus de France. Founded in Beijing and renowned for authentic “Shuan Yang Rou”. 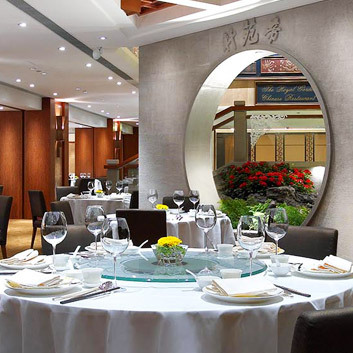 Huaiyang cuisines are also offered to widen your choices at Dong Lai Shun restaurant in The Royal Garden Hong Kong. 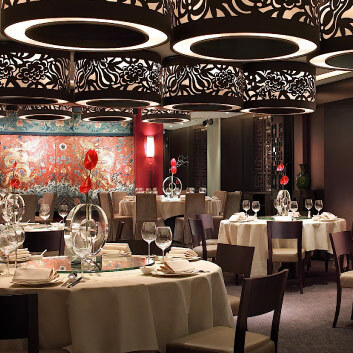 It has been crowned as the one Michelin star restaurant in the Michelin Guide Hong Kong Macau 2013. At The Royal Garden Chinese Restaurant one can live like a Mandarin. Modeled on a Chinese official's formal water garden of yesteryear, this gourmet restaurant has won many awards and distinctions. Here, “home” cooked, seasonal Cantonese cuisine and daily fresh seafood are the order of the day. 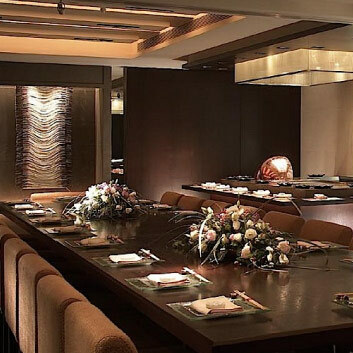 It is a popular venue for lunch time dim-sum and evening dining with friends and business associates in Tsim Sha Tsui. Shikigiku Japanese Restaurant, this headline-making restaurant offers kaiseki menus in addition to signature tempura, teppanyaki, sushi and sashimi. The genuine art of Shikigiku 's kaiseki dining experience can be seen in its use of fresh seasonal ingredients, artistic presentations and perfect cooking techniques – displayed by the restaurant’s skilled chefs. A Hong Kong branch of the popular award-winning San Francisco restaurant. 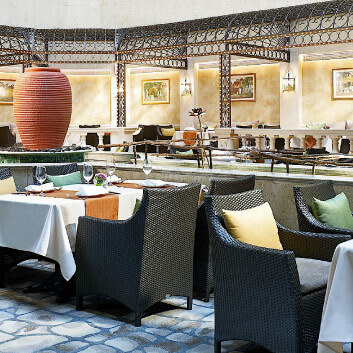 Located on The Royal Garden’s third floor mezzanine level and overlooking the atrium's greenery and water features, Le Soleil offers Vietnamese cuisine with a touch of Asian-fusion. It offers a medley of tastes and flavors. Open daily for lunch and dinner. J’s Bar Bistro is a culinary and social concept and it promises an authentic experience with grand, yesteryear luxury and classic European style. The bistro serves a light causal menu offering tapas, yakitori, a selection of specialty cheeses, and crafted cocktails. The Greenery offers an "international" menu for all-day, casual dining in a garden-like setting, surrounded by the atrium’s lush foliage and burbling water features and – in the evenings, the melodies of a live pianist. 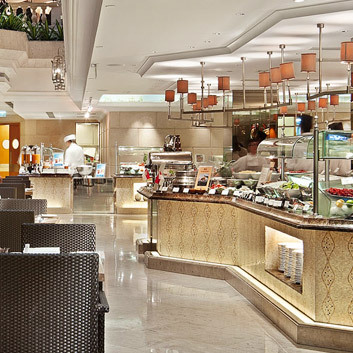 Breakfast selections include buffet and a la carte options. The original Sabatini Ristorante Italiano restaurant opened in Rome in 1954. 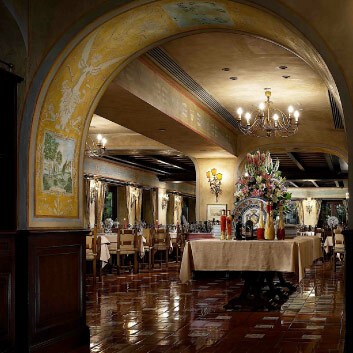 Since then, the Sabatini brothers' flair and excellence have led to 2 other Sabatini Ristorante Italiano restaurants around the world, including this fine dining room at The Royal Garden. Here, an authentic yet creative menu is prepared by our experienced chefs and is served in a picturesque “countryside” setting. Just off the Lobby is Fine Foods. It is the perfect spot for your discerning gourmet choices. 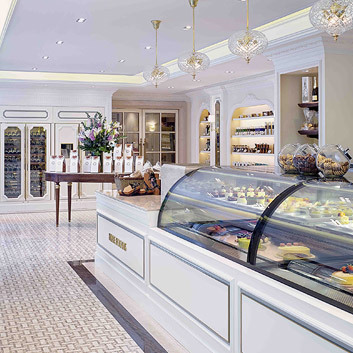 Last year (2012), it has been redesigned to recreate the unique features of a French patisserie, with elegant French décor and warm timber ceiling beams to create a cozy ambience. 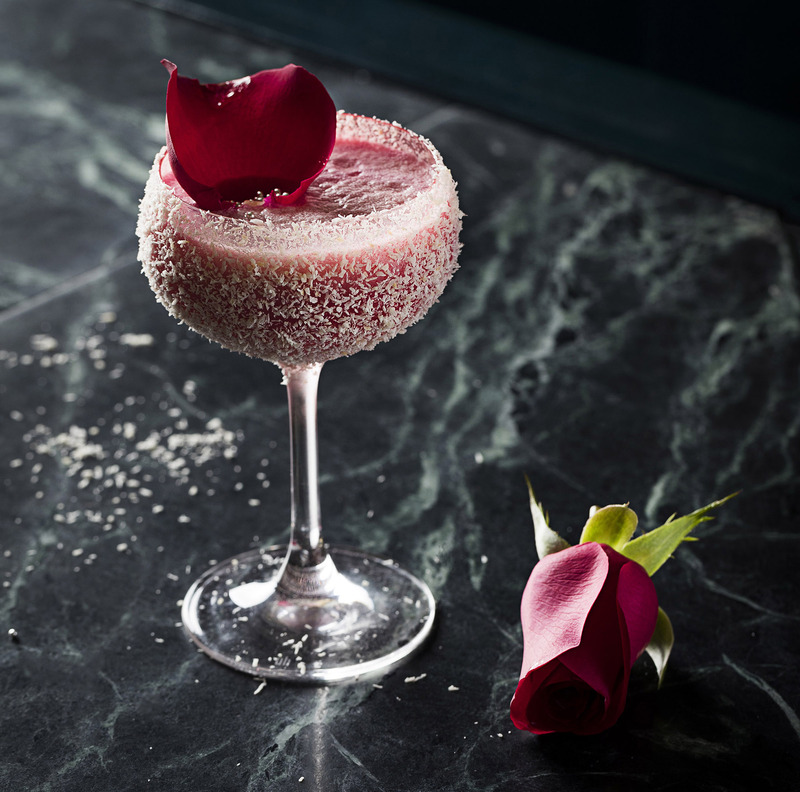 Delicatessen offers a full range of delicacies and an extensive selection of liquors and fine wines.